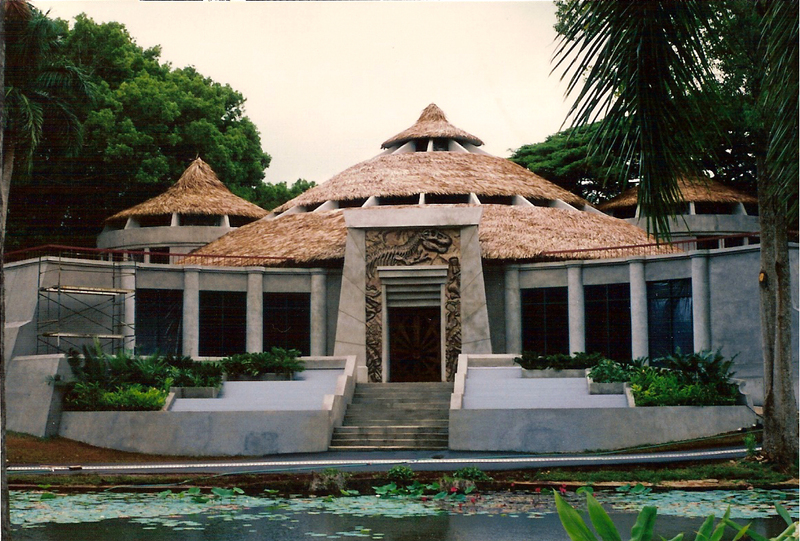 The Visitor’s Center was the largest of four buildings connected by walkways at Isla Nublar’s main compound. This building had multiple functions as the receiving area for new arrivals, a state of the art genetics laboratory, hatchery, debarkation point for the main tour, as well as the park’s command and control center. It was clearly still under construction at the time the inspection was started, with busy workers and equipment seen in the rotunda, and outside. The building itself appeared to be largely complete, as many of the vital areas within were already in use. 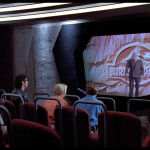 With a grand entrance of full-sized Tyrannosaurus and Alamosaurus skeletons, guests would also find the cafeteria and a theater where a film on the creation of Jurassic Park was shown featuring the animated Mr. DNA. Also, the Hatchery and Control Room were located in the Visitor’s Center. Electrical Tour Cars came out from an underground garage and stopped at the front of the Visitor’s Center where guests would be taken on an automated tour that circles the animal paddocks and returns them once again to the entrance of the Center. 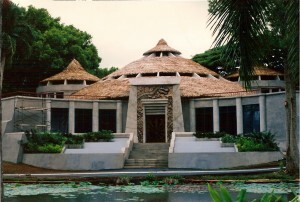 The exterior of the Visitor’s Center appeared to be concrete with the front lined with tinted glass windows separated by columns, and three rotundas, whose domes were given the appearance of thatched roofing. The portion of the roof surrounding the rotunda domes was lined with a balustrade. A stairway led up to the two tall doors of the entrance, surrounded by decorative plants and fountains to either side. Surrounding the door frame on three sides was a relief made to give the appearance of rock containing several fossilized dinosaurs. 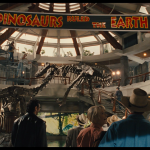 The central rotunda had a dome partially lined with glass, and had a high ceiling that housed a pair of full sized skeletal replicas of a Tyrannosaurus rex, and an Alamosaurus sanjaunensis. 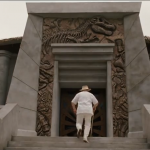 The doors to the rotunda, which were double hinged to swing both inwards and outwards, were attended by a pair of Jurassic Park employees. 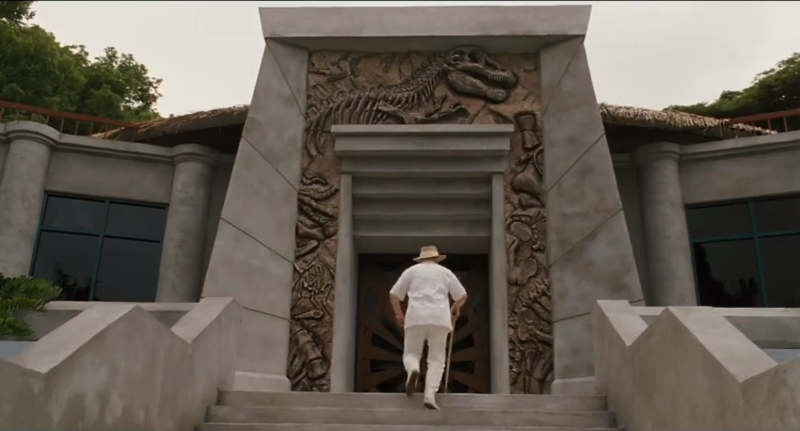 Once inside, the guests were led up a round staircase, around the fossil replicas, to the second floor. The theater was actually a ride that was given the initial appearance of a simple cinema, which then turned into an automated rotating tour of part of the second level of the Visitors Center. 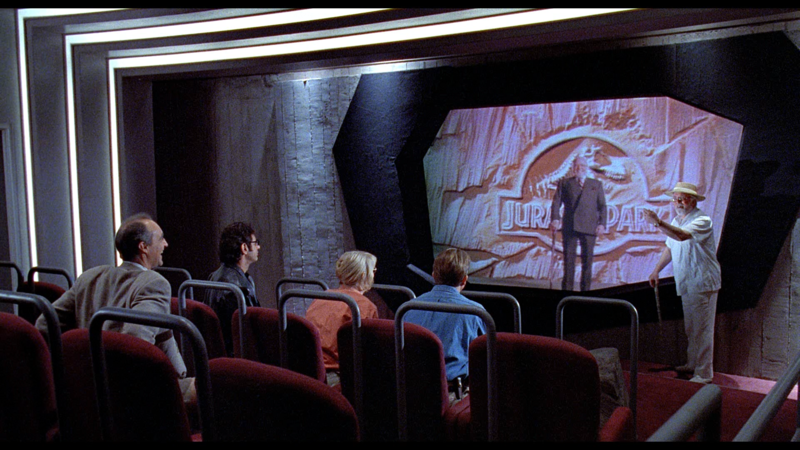 When the VIPs took their seats, an incomplete short film was played, featuring John Hammond, and the animated Mr. DNA. 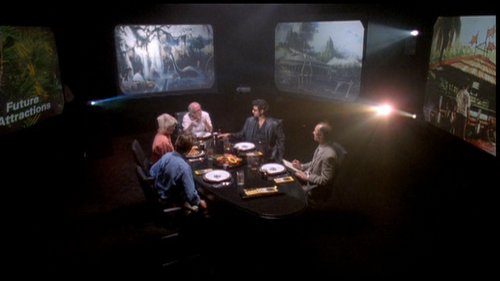 After viewing the film to Hammond’s satisfaction, the safety bars were lowered via remote control, and the seats began a slow rotation that gave a view of the genetics lab, and the control room through large glass windows before doctors Alan Grant, Ian Malcolm, and Ellie Sattler interrupted the tour by forcing the bars up and exiting the room. 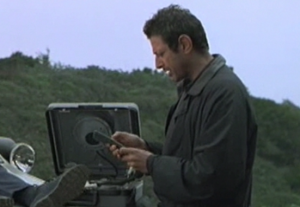 John Hammond and Donald Gennaro were able to do the same with the assistance of the remote control. 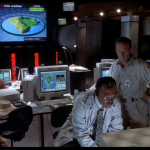 The Control Room was the central operations center for Jurassic Park. 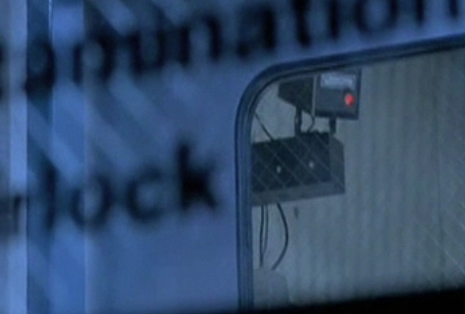 Video surveillance could have been monitored at any of the computers, along with controls for the fences and tour commands. The system was mostly automated, being able to run with a minimal amount of staff for up to three days. 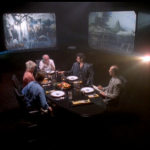 Access seemed to have been normally restricted to Hammond, Ray Arnold, Dennis Nedry, Robert Muldoon, and certain park associates. Computer systems utilized included the SGI Indigo, SGI Crimson, and CM-5 Thinking Machines. 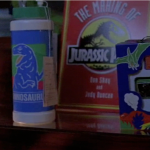 Primary computing was done via Mac Quadra 700’s and these interfaced within Jurassic Park’s main operating system for a UNIX-based GUI with a 3D File system navigator. The Control Room was powered through four main circuit breakers, each of which could have been turned off manually. However, the entire system had never needed to be shut down before. Other equipment used included 4D/480 VGXT Computers and Silicon Graphics Monitors. 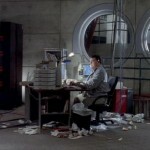 After Dennis Nedry’s computer program damaged the system, a complete system shutdown was issued. Although the computers were ready to be put back on-line, the shutdown also caused the circuit breakers to power down. Once they had been restored, the entire park security was able to be brought back on-line through a single computer terminal. 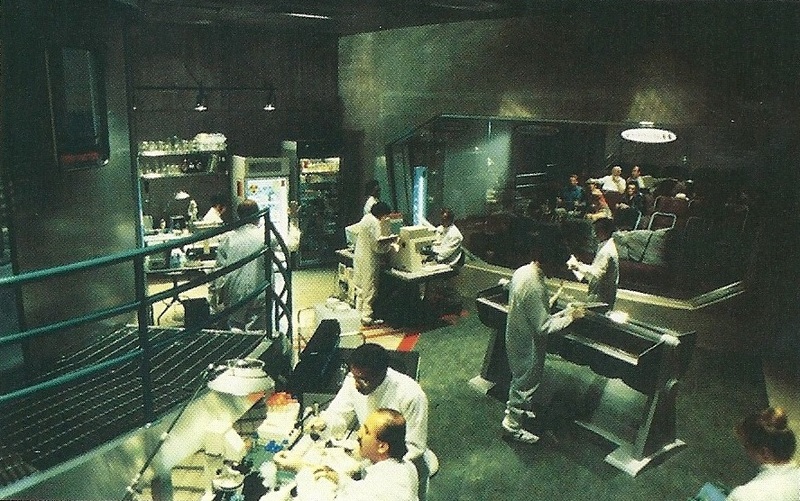 The genetics lab was a single room dedicated to the genetic engineering process that produced Jurassic Park’s dinosaurs. It contained computers, refrigeration units, embryo storage units, incubators, and other assorted lab equipment used by the scientists. This cleanroom was quarantined by an airlock to minimize contamination from the outside. The room was visible from the theater room and is showcased for visitors. The embryos were stored in a special chamber separate from the rest of the lab. 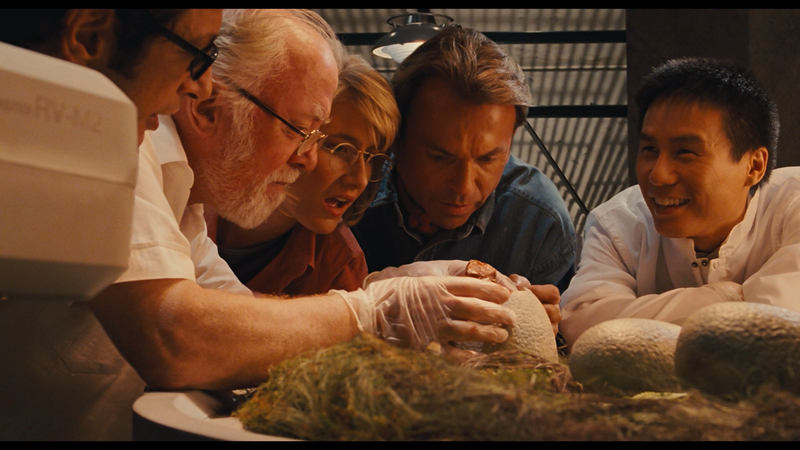 The hatchery was a section of Jurassic Park overseen by the Jurassic Park Scientists, and was adjacent to the genetics laboratory. Here was where fertilized eggs, mostly Ostrich and Emu, were placed in incubation areas and kept at a warm temperature for hatching. 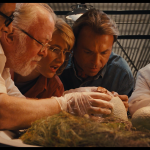 The VIPs were led in by John Hammond and met with Dr. Henry Wu just as a young Velociraptor hatched from one of the incubating eggs. A Mitsubishi Movemaster RV-M2 was programmed to automatically rotate the eggs and hold them steady while hatching commenced. Moss was placed around the eggs to hold both heat and moisture in order to assist in the incubation process. 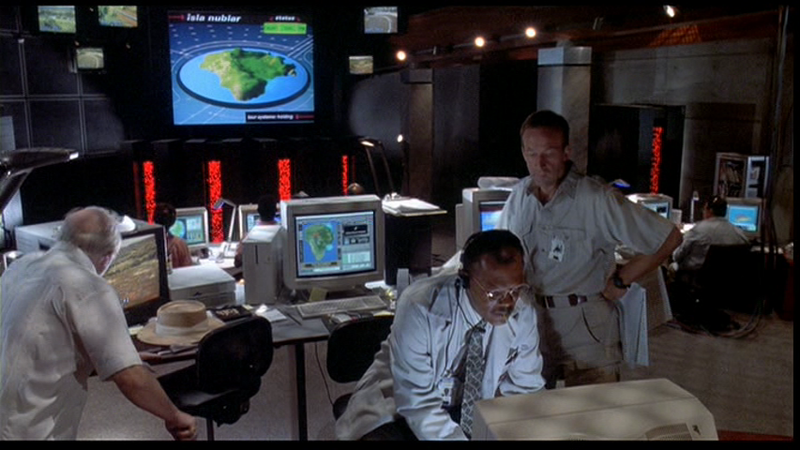 Nedry was able to gain access to the lab and the embryo storage chamber within once the security systems to Jurassic Park were shut down. 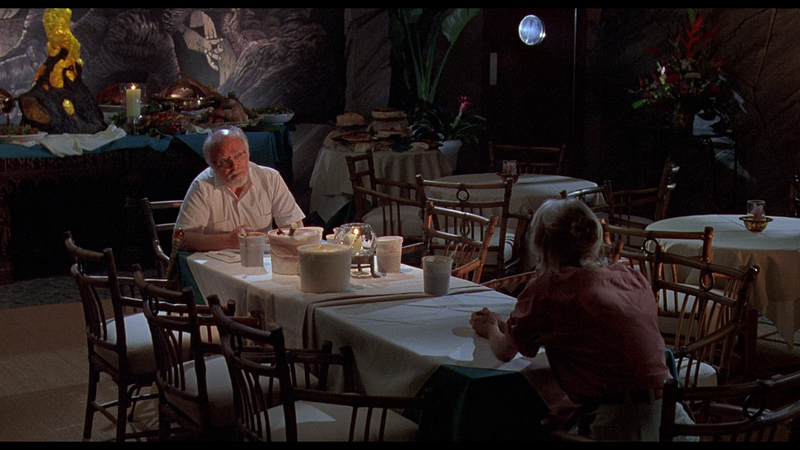 Just beyond the Main Hall, the Dining Area is where the majority of Jurassic Park’s guests would eat their meals. Host to the ‘Les Gigantes’ restaurant, an array of foods are lined up in a self-serving manner which include all manner of fruits, vegetables, meats and desserts. 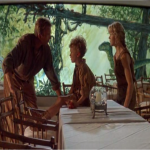 Separating the Dining Area from the Main Hall is a mural showing the dinosaurs Parasaurolophus, Gallimimus, and Velociraptor. 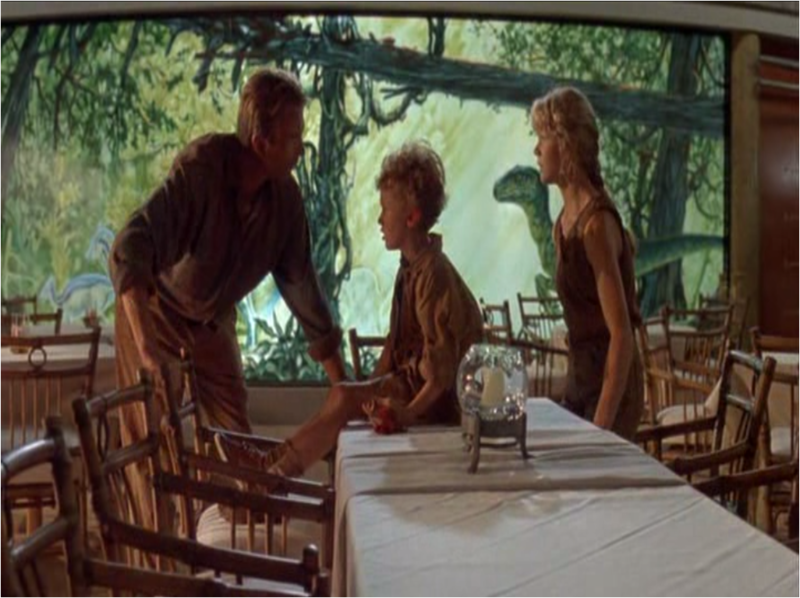 On the opposite end, behind the tables, was another mural portraying a collage of various Jurassic Park dinosaurs. 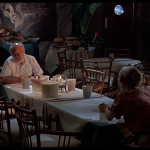 The night after the fences shut down, John Hammond was eating ice cream that had been melting while he spoke with Dr. Sattler. 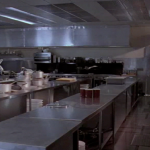 Later, after the power was restored, Dr. Alan Grant left Lex and Tim in the Dining Area while he searched for help. The children ate food from the buffet that had been left out, but were interrupted when a Velociraptor found her way into the Main Hall, her shadow cast on the mural. The restaurant itself was adjoined by the Gift Shop near the same location. 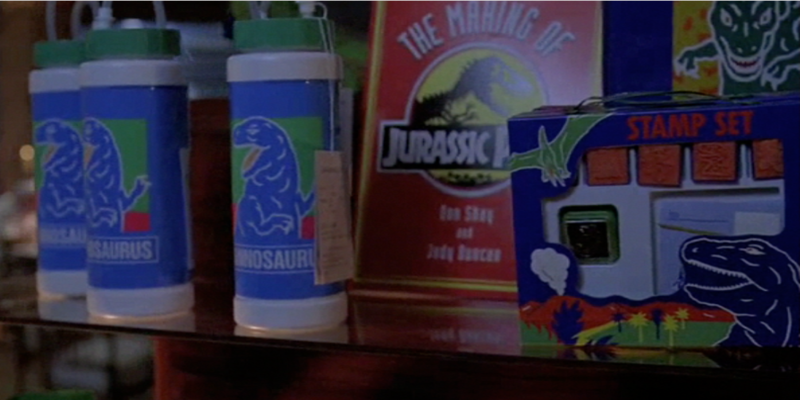 The gift shop housed numerous plush dinosaurs, Jurassic Park T-Shirts, and various other souvenirs such as coffee mugs, lunch boxes, and “The Making of Jurassic Park” books were kept for sale at this location. Located in the Visitor’s Center adjacent to the Dining Area, the Kitchen was where the food for guests was prepared. Although only two meals were seen, lunch and a buffet prepared by gourmet chef Alejandro, other meals would have been prepared in the same manner. The Kitchen was equipped with stainless steel cupboards and various utensils, pots and pans of every kind. There were two doors that afforded passage to and from the kitchen, one set on each side of the dining room back wall across from the Gift Shop. The doors must be opened via a handle, unlike most restaurant doorways that can simply be pushed open. There was also a freezer for items that need to be kept frozen. 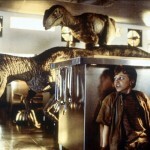 After the Velociraptors escaped, Lex and Tim ran into the kitchen in an attempt to flee from the dinosaurs. One of the Raptors was knocked unconscious for a moment when it ran headlong into one of the stainless steel panels on the wall, mistaking Lex’s reflection for Lex herself. 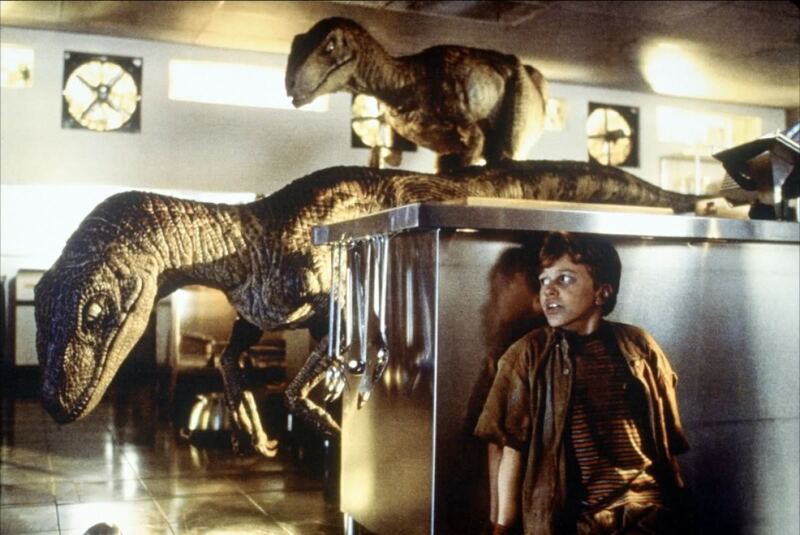 A second Raptor chased Tim into the freezer and was locked therein. Hammond took his VIPs to this dark location in the Visitor’s Center after Grant insisted on seeing the Velociraptor Holding Pen. The visitors were served Chilean Sea Bass while a series of slide shows displayed in the background information of the Visitor’s Center construction, additional attractions, and projected revenue the park was going to generate. 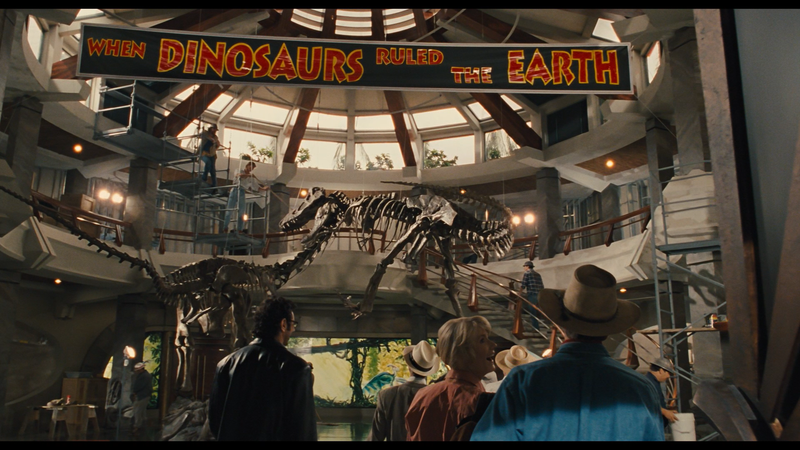 It was here that doctors Grant, Malcolm, and Sattler ventured forth their doubts on what Hammond was attempting to accomplish with Jurassic Park as well as their concern for scientific moral regard. The VIP dining area itself could be utilized for conferences and various types of meetings. While the Visitor’s Center had no visible guards, it did have at least one security measure in place throughout the building. This system is the series of computer controlled door locks, which restricted access to all important areas in the building to appropriate personnel. 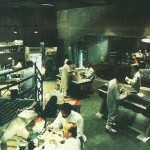 The Control Room, Genetics lab, and other doors on the second level were known to utilize the system. Also present were SVS video surveillance cameras. 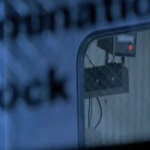 Dennis Nedry disabled these systems to freely access the Genetics lab and embryo storage units within. 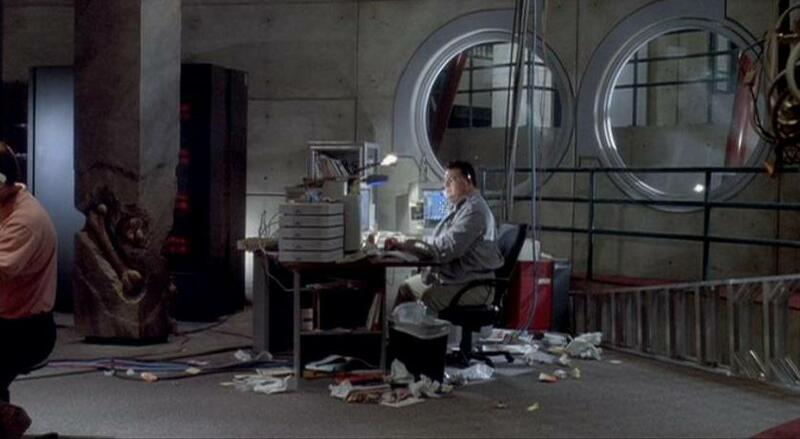 The next morning, Lex was able to re-enable the security systems via one of the terminals at Nedry’s workstation. 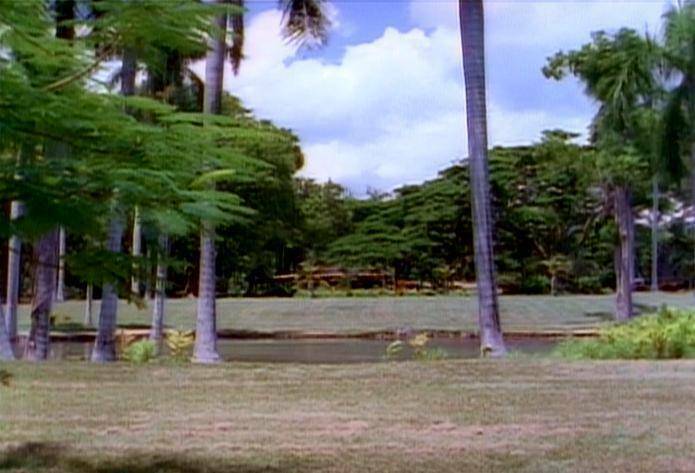 Many of the exterior shots were filmed on location on the Hawaiian island of Kauai, while the interior shots were filmed on several sound stages at Universal Studios, in Los Angeles. The central rotunda was filmed on Stage 12, and the control room as was filmed on Stage 28. The museum quality skeletal replicas in the rotunda were constructed by Research Casting International. For the Control Room, nearly 1 million dollars worth of computing equipment was on the set, on loan from companies including Apple, Silicon Graphics, UMAX (credited as SuperMac), and Thinking Machines.